Everybody has something that they hate shopping for. Swimwear, jeans, cocktail dresses – my particular poison is shopping for scarves. More often than not, I find they are either too bulky or aren’t big/long enough, making them impossible to wrap and style well. You must know what I’m talking about – I can’t be the only one who has trouble with this! For example, I have this old scarf from J.Crew – it is in the cutest print + color scheme, but for some reason it just never looks right. No matter how I wrap it around my neck, it’s just too short and stiff. That’s why when I find a scarf that’s amazing, I buy it in every color! I recently discovered these oversized cashmere scarves by Heidi Wynne and they have become my new obsession. These scarves are huge, extremely soft and layer like a dream. I’ve been wearing my black scarf non-stop since getting it last month, but I’m also thinking about picking it up in gray for transitioning into spring. This scarf also comes in red, green and navy! If you’re still looking for some last minute holiday gifts for family or friends, I suggest the red one! Lucky for you, Heidi is graciously offering my wonderful readers 25% off all orders + free standard domestic shipping until January 1st when you enter code STYLESCRIBE25 at checkout! 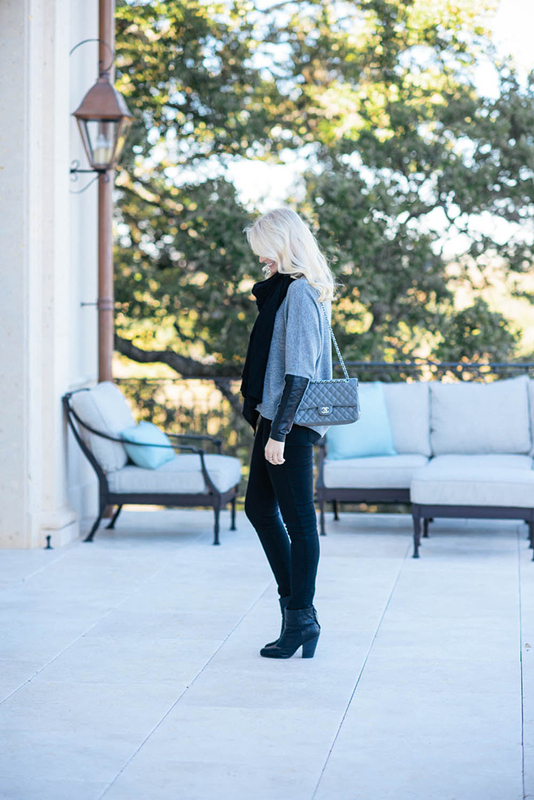 Don’t miss your chance to snag this classic scarf and other cashmere favorites like this luxe travel set, this v-neck sweater or this lightweight wrap! I love black and grey together, and these booties are perfect. I like a good scarf, but love an oversize cashmere one! Great choice! I have been living in my over-sized scarves right now. This version is so pretty, thank you for the brand intro! I love a simple black and grey look. Sounds like the perfect scarf. Love your black and grey. 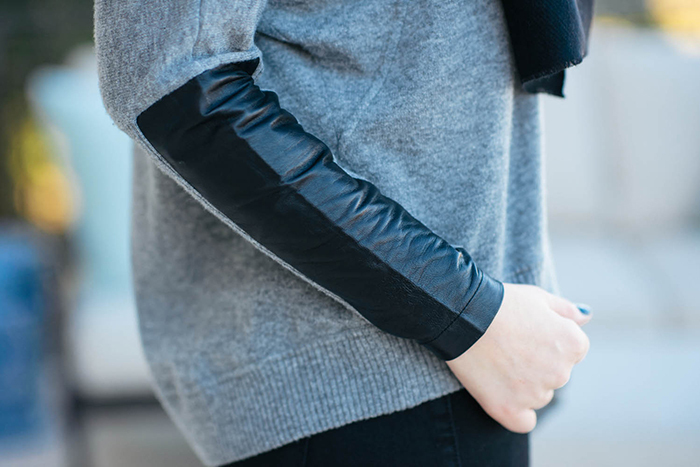 Love the leather detailing on the sleeves of your sweater! I’m not a huge scarf wearer but this scarf looks great. So pretty, Merritt! I love the sweater too. I feel the same. They are never long enough, and half the “blanket scarves” out there are not big enough!! Love this one though, and you look gorgeous as always! AH love LOVE this look! Black + grey = my two favorite colors (if you can call them that?). A cashmere scarf if the perfect accessory. That’s a beautiful scarf! Love how you styled it.